Many cell adhesion molecules are known to be involved in the process of inflammation. At the site of inflammation, leukocytes first adhere to the vascular endothelial cells prior to the extravasation process. It is postulated that the members of a cell adhesion family, selectins, play crucial roles in the initial adhesion of leukocytes to endothelial cells, while other adhesion molecules such as integrins and members of the Ig superfamily are involved in a later process. Cell adhesion mediated by selectins and their carbohydrate ligands arises to the tethering and rolling of leukocytes on endothelial linings, and this leads to the secondary firm adhesion and signal transduction mediated by integrins activated through the action of inflammatory chemokines such as IL-8 or MIP-1beta presented at the surface of endothelial cells (Fig. 1). Fig. 1　Molecules involved in adhesion of leukocytes to endothelial cells. The selectin family consists of three members, E-, P- and L-selectin. The carbohydrate ligand for E-selectin on leukocytes was shown to be sialyl Lewis X in the early 1990s. Since the C-type lectin domains of E- and P-selectins are highly homologous to each other, it was no surprise that sialyl Lewis X was later found to serve as a ligand also for P-selectin. However, there are several significant differences between the characteristics of E- and P-selectin ligands. For instance, the P-selectin ligand on leukocytes is protease-sensitive, while that for E-selectin is highly resistant to protease treatments. This led to the discovery of PSGL-1 (P-selectin glycoprotein ligand-1), a 220 kDa glycoprotein on leukocytes. PSGL-1 carries sialyl Lewis X determinant on its carbohydrate side chains, and has at least one sulfated tyrosine residue near the N-terminus. The sialyl Lewis X determinant and sulfated tyrosine residue are shown to be both necessary for P-selectin to bind the cells, while E-selectin requires presence of only sialyl Lewis X determinant. It is still controversial whether L-selectin plays as equally important a role as E- and P-selectins in the recruitment of leukocytes in inflammation. L-selectin is suggested to be involved primarily in the physiological homing of lymphocytes to peripheral lymph nodes. High endothelial venules (HEV) are known to serve as an entrance for those lymphocytes homing into peripheral lymph nodes. The HEV endothelial cells in human lymph nodes show a peculiar staining pattern in immunohistochemical studies. These cells were not stained by most classical anti-sialyl Lewis X antibodies, but they were readily stained by a limited group of variant-type anti-sialyl Lewis X antibodies. Later it was disclosed that a sulfated form of sialyl Lewis X, the sialyl 6-sulfo Lewis X determinant, is expressed on HEV in human lymph nodes, and serves as the major ligand for L-selectin. The successful reconstitution of L-selectin binding activity by the transfection of cells with both fucosyltransferase and sulfotransferase cDNAs, but not with fucosyltransferase cDNA alone, clearly supported the finding that sialyl 6-sulfo Lewis X is the much preferred ligand to conventional sialyl Lewis X for L-selectin. Sialyl 6-sulfo Lewis X, but not conventional sialyl Lewis X, is strongly expressed on HEV endothelial cells of human peripheral lymph nodes, where it recruits naïve T lymphocytes expressing L-selectin and CCR7, the receptor for the chemokine SLC. The cell adhesion mediated by L-selectin and sialyl 6-sulfo Lewis X triggers the action of SLC chemokine and activates lymphocyte integrins, leading the cells to home into lymph node parenchymas (Fig. 1). Sialyl 6-sulfo Lewis X is also expressed on HEV-like venules in Peyer's patches and appendices, where it recruits gut-homing helper memory T lymphocytes expressing L-selectin and alpha4beta7 integrin and presumably CCR9, the receptor for TECK. Here, the interaction of L-selectin and sialyl 6-sulfo Lewis X, together with the interaction of CCR9-TECK and alpha4beta7 integrin-MadCAM-1 will allow the cells to home into intestinal tissue. Sialyl 6-sulfo Lewis X is also found on a small subset of skin-homing helper memory T cells, which do not express CCR7 or alpha4beta7 integrin, but express CCR4, the receptor for the chemokine, TARC. Interaction of sialyl 6-sulfo Lewis X with P- and E-selectins, which are expressed at low levels on skin endothelial cells, will mediate homing of these cells to the skin in synergy with CCR4-TARC system. 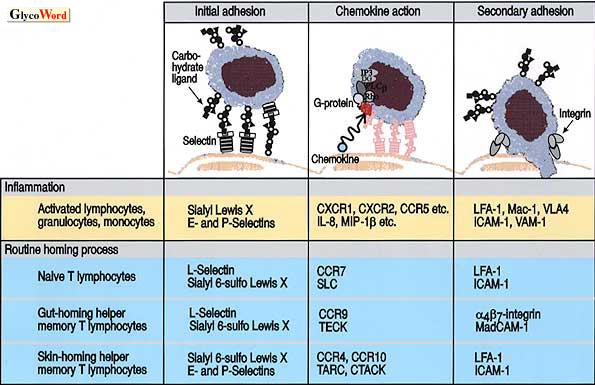 The sulfated selectin ligand is, so far as is known, always associated with routine physiological homing of lymphocytes in concert with constitutively-expressed homeostatic lymphoid chemokines, but not with so-called pro-inflammatory chemokines. On the other hand, conventional sialyl Lewis X is hardly expressed on resting lymphocytes, and its expression is strongly induced by the activation of lymphocytes, which is known to accompany induction of fucosyltransferase mRNA. Expression of sialyl 6-sulfo Lewis X is diminished, and a remarkable induction of conventional sialyl Lewis X is observed when human peripheral lymphocytes are stimulated with TPA. This suggests that conventional sialyl Lewis X plays a major role in inflammatory response, while sialyl 6-sulfo Lewis X may not have a positive role in inflammation. It is noteworthy that the cell adhesion system mediating routine homing process seems to be under strict regulation, such as shedding of L-selectin by metallo-proteinase or modulation of sialic acid moiety on the sulfated ligand upon stimulation of the cells.